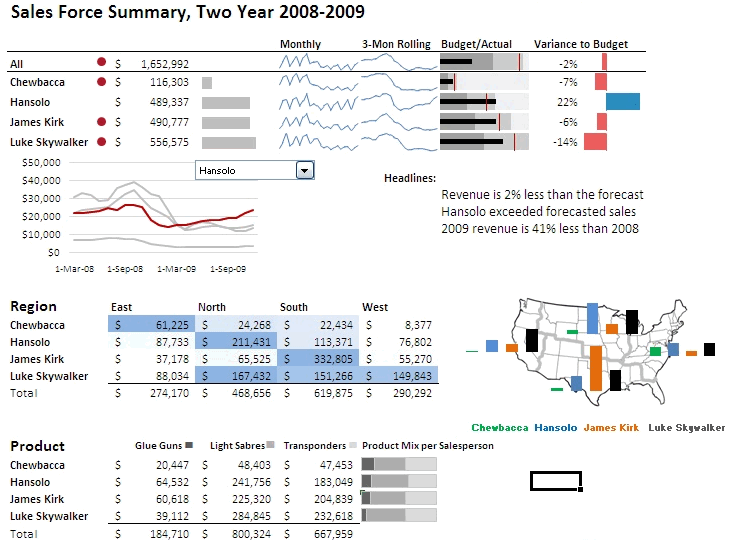 Open BI: Sparklines for Excel ! Today I want to speak about Sparklines for Excel, "a set of free user defined functions for Excel to create sparklines". Sparklines ? You know, those little graphics, often cell sized, as seen on a lot of financial / stock exchange / scientific screens. Well, Frabrice Rimlinger is a smart french guy who coded these sparklines for Excel. VBA code, for all Excel flavors. Have a look to his blog and download the macros. It is worth a try ! And now, my own personal usage of Sparkline : graphically showing source table sizes, related to my current datawarehouse project in Paris. I'm using the treemap component : each square size is calculated reagarding the table size. Colorization is done with a dynamic color scale. Merci pour post Vince !